b) Transactions and other events of the current period that are recognized in an enterprise's income statement. It is inherent in the recognition of an asset or liability in the financial statements, enterprise expects to recover or settle the carrying amount of that asset or liability. If it is probable that recovery or settlement of that carrying amount will make future tax payments larger or smaller than they would be if such recovery or settlement were to have no tax consequences, this Standard requires an enterprise to recognize a deferred tax liability or deferred tax asset, with certain limited exceptions. This Standard requires an enterprise to account for the tax consequences of transactions and other events in the same way that it accounts for the transactions and other events themselves. Thus, for transactions and other events recognized in the income statement, any related tax effects are also recognized in the income statement. For transactions and other events recognized directly in equity, any related tax effects are also recognized directly in equity. This Standard also deals with the recognition of deferred tax assets arising from unused tax losses or unused tax credits and the presentation of income taxes in the financial statements and the disclosure of information relating to income taxes. Income taxes include all income taxes which are based on taxable profits including profits generated from production and trading activities in other countries that the Socialist Republic of Vietnam has not signed any double tax relief agreement. 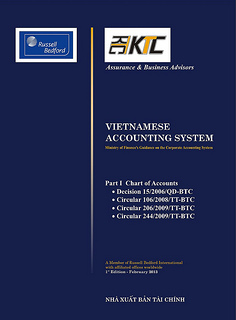 Income taxes also include other related taxes, such as withholding taxes on foreign individuals or organizations with no permanent standing in Vietnam when they receives dividends or distribution from their partnership, associates, joint venture or subsidiary; or making a payment for services provided by foreign contractors in accordance with regulations of the prevailing Law on corporate income taxes. Accounting profit: is net profit or loss for a period before deducting tax expense, determined in accordance with the rules of accounting standards and accounting system. Taxable profit : is the taxable profit for a period, determined in accordance with the rules of the current Law on Income taxes, upon which income taxes are payable or recoverable. Income tax expense (tax income) : is the aggregate amount of current income tax expense (income) and deferred income tax expense (income) included in the determination of profit or loss for the period. Current income tax :is the amount of income taxes payable or recoverable in respect of the current year taxable profit and the current tax rates. Deferred income tax liabilities :are the amounts of income taxes payable in future periods in respect of taxable temporary differences in the current year. c) the carry forward of unused tax credits. b) Deductible temporary differences, which are temporary differences that will result in amounts that are deductible in determining taxable profit of future periods when the carrying amount of asset of liability is recovered or settled. Income tax expense comprises current tax expense and deferred tax expense. Tax income comprises current tax income and deferred tax income. 04. The tax base of an asset is the amount that will be deductible for tax purposes against any taxable economic benefits that will flow to an enterprise when it recovers the carrying amount of the asset. If those economic benefits will not be taxable, the tax base of the asset is equal to its carrying amount. (1) A fixed asset has historical cost of 100: for tax purposes, depreciation of 30 has already been deducted in the current and prior periods and the remaining cost will be deductible in future periods, either as depreciation or through a deduction on disposal. Revenue generated by using the asset is taxable, any gain on disposal of the machine will be taxable and any loss on disposal will be deductible for tax purposes. The tax base of the asset is 70. (2) Trade receivables have a carrying amount of 100. The related revenue has already been included in taxable profit (tax loss). The tax base of the trade receivables is 100. (3) Dividends receivable from a subsidiary have a carrying amount of 100. The dividends are not taxable. In substance, the entire carrying amount of the asset is deductible against the economic benefits. Consequently, the tax base of the dividends receivable is 100. (In the above example, there is no taxable temporary difference. It could also be explained as follows: the tax base of dividends receivable is nil and tax rate of 0% applied to taxable temporary difference of 100. Under both cases, there is no deferred tax liability). (4) A loan receivable has a carrying amount of 100. The repayment of the loan will have no tax consequences. The tax base of the loan is 100. 05. The tax base of a liability is its carrying amount, less any amount that will be deductible for tax purposes in respect of that liability in future periods. In the case of revenue which is received in advance, the tax base of the resulting liability is its carrying amount, less any amount of the revenue that will not be taxable in future periods. (1) Current liabilities include accrued expenses for employment benefits with a carrying amount of 100. The related expense will be deducted for tax purposes on a cash basis. The tax base of the accrued expenses is nil. (2) Current liabilities include interest revenue received in advance, with a carrying amount of 100. The related interest revenue was taxes on a cash basis. The tax base of the interest received in advance is nil. (3) Current liabilities include accruals for telephone, water and electricity expenses, with a carrying amount of 100. The accrued expenses have already been deducted for tax purposes in the current year. The tax base of the accrued expenses is 100. (4) Current liability includes accrued fines with a carrying amount of 100. Fines are not deductible for tax purposes. The tax base of the accrued fines is 100. In the above example, there is no deductible temporary difference. It could also be explained as follow: tax base of the fine is nil and tax rate of 0% applied to deductible temporary difference of 100. Under both cases, there is no deferred tax asset. (5) A loan payable has a carrying amount of 100. The repayment of the loan will have no tax consequences. The tax base of the loan is 100. 06. Some items have a tax base but are not recognized as assets and liabilities in the balance sheet. For example, cost of supplies and tools are recognized as an expense in determining accounting profit in the period in which they are incurred but will only be permitted as a deduction in determining taxable profit (tax loss) until a later period. The difference between the tax base of the cost of supplies and tools, being the amount the taxation authorities will permit as a deduction in future periods, and the carrying amount of nil is a deductible temporary difference that results in a deferred tax asset. 07. Where the tax base of an asset or liability is not immediately apparent, it is helpful to consider the fundamental principle upon which this Standard is based: that an enterprise should, with certain limited exceptions, recognize a deferred tax liability (asset) whenever recovery or settlement of the carrying amount of an asset or liability would make future tax payments larger (smaller) than income tax payable in the current year if such recovery or settlement were to have no tax consequences. 08. Current tax for current and prior periods should, to the extent unpaid, be recognized as a liability. If the amount already paid in respect of current and prior periods exceeds the amount due for those periods, the excess should be recognized as an asset. Recognition of deferred tax liabilities and deferred tax assets. 09. A deferred tax liability should be recognized for all taxable temporary differences, unless the deferred tax liability arises from the initial recognition of an asset or liability in a transaction which at the time of the transaction, affects neither accounting profit nor taxable profit (tax loss). 10. The recognition base of an asset is the carrying amount of that asset that will be recovered in the form of economic benefits that flow to the enterprise in future periods. When the carrying amount of the asset exceeds its tax base, the amount of taxable economic benefits will exceed the amount that will be allowed as a deduction for tax purposes. This difference is a taxable temporary difference and the obligation to pay the resulting income taxes in future periods is a deferred tax liability. As the enterprise recovers the carrying amount of the asset, the taxable temporary difference will reserve and the enterprise will have taxable profit. This makes it probable that economic benefits will be decreased due to tax payments. Therefore, this Standard requires the recognition of all deferred tax liabilities, except in certain circumstances described in paragraph 09. A fixed asset which cost 150 has a carrying amount of 100. Cumulative depreciation for tax purposes is 90 and the tax rate is 28%. The tax base of the asset is 60 (cost of 150 less cumulative tax depreciation of 90). To recover the carrying amount of 100, the enterprise must earn taxable income of 100, but will only be able to deduct tax depreciation of 60. Consequently, the enterprise will pay income taxes of 11.2 (40 at 28%) when it recovers the carrying amount of the asset. The difference between the carrying amount of 100 and the tax base of 60 is a taxable temporary difference of 40. Therefore, the enterprise recognizes a deferred tax liability of 11.2 (40 at 28%) representing the income taxes that it will pay when it recovers the carrying amount of the asset. 11. Some temporary differences arise when income or expense is included in accounting profit in one period but is included in taxable profit in a different period. Such temporary differences are often described as timing differences. These temporary differences are taxable temporary differences and will result in deferred tax liabilities. Depreciation used in determining taxable profit (tax loss) may differ from that used in determining accounting profit. The temporary difference is the difference between the carrying amount of the asset and its tax base which is the original cost of the asset less all deductions in respect of that asset permitted by the tax law in determining taxable profit of the current and prior periods. A taxable temporary difference arises, and results in a deferred tax liability, when tax depreciation is more accelerated than accounting depreciation (if tax depreciation is less rapid than accounting depreciation, a deductible temporary difference arises, and results in a deferred tax asset). 12. A temporary difference may arise on initial recognition of an asset or liability, for example if part or all of the cost of an asset will not be deductible for tax purposes. The method of accounting for such a temporary difference depends on the nature of the transaction which led to the initial recognition of the asset. 13 A deferred tax asset shall be recognized for all deductible temporary differences to the extent that it is probable that taxable profit will be available against which the deductible temporary difference can be utilised, unless the deferred tax asset arises from the initial recognition of an asset or liability in a transaction which at the time of transaction, affects neither accounting profit nor taxable profit (tax loss). 14. It is inherent in the recognition of a liability that the carrying amount will be settled in future periods through an outflow from the enterprise of resources embodying economic benefits. When resources flow from the enterprise, part or all of their amounts may be deductible in determining taxable profit of a period later than the period in which the liability is recognized. In such cases, a temporary difference exists between the carrying amount of the liability and its tax base. Accordingly, a deferred tax asset arises in respect of the income taxes that will be recoverable in the future periods when that part of the liability is allowed as a deduction in determining taxable profit. Similarly, if the carrying amount of an asset is less than its tax base, the difference gives rise to a deferred tax asset in respect of the income taxes that will be recoverable in future periods. An enterprise recognizes a liability of 100 for accrued product warranty costs. For tax purposes, the product warranty costs will not be deductible until the enterprise pays claims. The tax rate is 28%. The tax base of the liability is nil (carrying amount of 100, less the amount that will be deductible for tax purposes in respect of that liability in future periods). In settling the liability for its carrying amount, the enterprise will reduce its future taxable profit by an amount of 100 and, consequently, reduce its future tax payments by 28 (100 at 28%). The difference between the carrying amount of 100 and the tax base of nil is a deductible temporary difference of 100. Therefore, the enterprise recognizes a deferred tax asset of 28 (100 at 28%), provided that it is probable that the enterprise will earn sufficient taxable profit in future periods to benefit from a reduction in tax payments. Accrual maintenance expense for fixed assets may be deducted in determining accounting profit but deducted in determining taxable profit when these costs are actually paid by the enterprise. In this case, a temporary difference exists between the carrying amount of the accrual expense and its tax base. Such a deductible temporary difference results in a deferred tax assets as economic benefits will flow to the enterprise in the form of a deduction from taxable profits when accrual expense is paid. 16. The reversal of deductible temporary differences results in deductions in determining taxable profits in future periods. However, economic benefits in the form of reductions in tax payments will flow to the enterprise only if it earns sufficient taxable profits against which the deductions can be offset. Therefore, an enterprise recognizes deferred tax assets only when it is probable that taxable profits will be available against which the deductible temporary differences can be utilised. b. in periods into which a tax loss arising from the deferred tax asset can be carried forward. In such circumstances, the deferred tax asset is recognized in the period in which the deductible temporary differences arise. b) tax planning opportunities are available to the enterprise that will create taxable profit in appropriate periods. (c) selling an asset that generates non-taxable income (such as a government bond) in order to purchase another investment that generates taxable income. When tax planning opportunities advance taxable profit from a later period to an earlier period, the utilisation of a tax loss or tax credit carry forward still depends on the existence of future taxable profit from sources other than future originating temporary differences. 21. A deferred tax asset should be recognized for the carry forward of unused tax losses and unused tax credits to the extent that it is probable that future taxable profit will be available against which the unused tax losses and unused tax credits can be utilised. 22. The criteria for recognising deferred tax assets arising from the carryforward of unused tax losses and tax credits are the same as the criteria for recognising deferred tax assets arising from deductible temporary differences. However, the existence of unused tax losses is strong evidence that future taxable profit may not be available. Therefore, when an enterprise has a history of recent losses, the enterprise recognizes a deferred tax asset arising from unused tax losses or tax credits only to the extent that the enterprise has sufficient taxable temporary differences or there is convincing other evidence that sufficient taxable profit will be available against which the unused tax losses or unused tax losses or unused tax credits can be utilised by the enterprise. In such circumstances, the Standard requires disclosure of the amount of the deferred tax asset and the nature of the evidence supporting its recognition (see paragraph 59). d) whether tax planning opportunities (see paragraph 19) are available to the enterprise that will create taxable profit in the period in which the unused tax losses or unused tax credits can be utilised. To the extent that it is not probable that taxable profit will be available against which the unused tax losses or unused tax credits can be utilised, the deferred tax asset is not recognized. 24. At each balance sheet date, an enterprise re-assesses unrecognized deferred tax assets. The enterprise recognizes a previously unrecognized deferred tax asset to the extent that it has become probable that future taxable profit will allow the deferred tax asset to be recovered. For example, an improvement in trading conditions may make it more probable that the enterprise will be able to generate sufficient taxable profit in the future for the deferred tax asset to meet the recognition criteria set out in paragraphs 13 or 21. (b) it is probable that the temporary difference will not reverse in the foreseeable future. 26. As a parent controls the dividend policy of its subsidiary, it is able to control the timing of the reversal of temporary differences associated with that investment (including the temporary differences arising not only from undistributed profits but also from any foreign exchange translation differences). Furthermore, it would often be impracticable to determine the amount of income taxes that would be payable when the temporary difference reverses. Therefore, when the parent has determined that those profits will not be distributed in the foreseeable future the parent does not recognize a deferred tax liability. The same considerations apply to investments in branches. 27. An enterprise accounts in its own currency for non-monetary assets and liabilities of a foreign operation that is integral to the enterprise's operations (see VAS 10, The Effects of Changes in foreign exchange rates). Where the foreign operation's taxable profit or tax loss (and, hence, the tax base of its non-monetary assets and liabilities) is determined in foreign currency, changes in the exchanges rate give rise to temporary differences. Because such temporary differences relate to the foreign operation's own assets and liabilities, rather than to the reporting enterprise's investment in that foreign operation, the reporting enterprise should recognizes the resulting deferred tax liability or (subject to paragraph 13) asset. The resulting deferred tax is reflected into the income statement (see paragraph 40). 28. An investor in an associate does not control that enterprise and is usually not in a position to determine its dividend policy. Therefore, in the absence of an agreement requiring that the profits of the associate will not be distributed in the foreseeable future, an investor recognizes a deferred tax liability arising from taxable temporary differences associated with its investment in the associate. In some cases, an investor may not be able to determine the amount of tax that would be payable if it recovers the cost of its investment in an associate, but can determine that it will equal or exceed a minimum amount. In such cases, the deferred tax liability is measured at this amount. 29. The arrangement between the parties to a joint venture usually deals with the sharing of the profits and identifies whether decisions on such matters require the consent of all the ventures or a specified majority of the ventures. When the venturer can control the sharing of profits and it is probable that the profits will not be distributed in the foreseeable future, a deferred tax liability is not recognized. b) taxable profit will be available against which the temporary difference can be utilised. 31. In deciding whether a deferred tax asset is recognized for deductible temporary differences associated with its investments in subsidiaries, branches and associates, and its interests in joint ventures, an enterprise considers the guidance set out in paragraph 17 to 20. 32. Current tax liabilities (assets) for the current and prior periods should be measured at the amount expected to be paid to (recovered from) the taxation authorities, using the tax rates (and tax laws) that have been enacted or substantively enacted by the balance sheet date . 33. Deferred tax assets and liabilities should be measured at the tax rates that are expected to apply to the financial year when the asset is realised or the liability is settled, based on tax rates (and tax laws) that have been enacted or substantively enacted by the balance sheet date. 34. Current and deferred tax assets and liabilities are usually measured using the tax rates that have been enacted. 35. The measurement of deferred tax liabilities and deferred tax assets should reflect the tax consequences that would follow from the manner in which the enterprise expects, at the balances sheet date, to recover or settle the carrying amount of its assets and liabilities. 36. Deferred tax assets and liabilities should not be discounted. 37. The reliable determination of deferred tax assets and liabilities on a discounted basis requires detailed scheduling of the timing of the reversal of each temporary difference. In many cases such scheduling is impracticable or highly complex. Therefore, it is inappropriate to require discounting of deferred tax assets and liabilities. To permit, but not to require, discounting would result in deferred tax assets and liabilities which would not be comparable between enterprises. Therefore, this Standard does not require or permit the discounting of deferred tax assets and liabilities. 38. The carrying amount of a deferred tax asset should be reviewed at each balance sheet date. An enterprise should reduce the carrying amount of a deferred tax asset to the extent that is no longer probable that sufficient taxable profit will be available to allow the benefit of part or all of that deferred tax asset to be utilized. Any such reduction should be reversed to the extent that it becomes probable that sufficient taxable profit will be available. 39. Accounting for the current and deferred tax effects of a transaction or other event is consistent with the accounting for the transaction or even itself which is addressed from paragraph 40 to 47 . 39. Current and deferred tax should be recognized as income or an expense and included in profit or loss for the period, except to the extend that the tax arises from a transaction or event which is recognized, in the same or a different period, directly in equity (see paragraphs 43 to 47). (b) Cost of tools and supplies is charged to the income statement in accordance with VAS 02 “Inventory” but should be regularly allocated for tax purposes. (c) A change in the manner of recovery of an asset. The resulting deferred tax is recognized in the income statement, except to the extent that it relates to items previously charged or credited to equity (see paragraph 45). 43. Current tax and deferred tax should be charged or credited directly to equity if the tax relates to items that are credited or charged, in the same or a different period, directly to equity. (b) Exchange differences arising on the translation of the financial statements of a foreign entity (see VAS 10 “Effects of Changes in foreign exchange rates”). (b) An enterprise determines that a deferred tax asset should be recognized, or should no longer be recognized in full, and the deferred tax asset relates (in whole or in part) to an item that was previously charged or credited to equity. In such cases, the current and deferred tax related to items that are credited or charged to equity is based on a reasonable pro- rata allocation of the current and deferred tax of the entity in the tax jurisdiction concerned, or other methods that achieve a more appropriate allocation in the circumstances. 46. When an asset is revaluated for tax purposes and that revaluation relates to an accounting revaluation of an earlier period, or to one that is expected to be carried out in a future period, the tax effects of both the asset revaluation and the adjustment of the tax base are credited or charged to equity in the periods in which they occur. However, if the revaluation for tax purpose is not related to an accounting revaluation of an earlier period, or to one that is expected to be carried out in a future period, the tax effect of the adjustment of the tax base is recognized in the income statement. 47. When an enterprise pays to any foreign organizations, foreign individuals that are non-resident in Vietnam, it must be required to pay a portion of income tax to tax authorities on behalf of these foreign organizations or individuals. In current jurisdictions, this amount is referred to as a withholding tax. Such amounts paid or payable to taxation authority is charged to equity as a part of dividends or interests. 48. Deferred tax assets and deferred tax liabilities should be presented separately from other assets and liabilities in the balance sheet. Deferred tax assets and deferred tax liabilities should be distinguished from current tax assets and current tax liabilities. b) intends either to settle on a net basis, or to realise the asset and settle the liability simultaneously. ii) different taxable entities which intend either settle current tax liabilities and assets on a net basis, or to realise the assets and settle the liabilities simultaneously, in each future period in which significant amounts of deferred tax liabilities or assets are expected to be settled or recovered. 52. To avoid the reversal of each temporary difference, this Standard requires an enterprise to set off a deferred tax asset against a deferred tax liability of the same taxable entity if, and only if, they relate to income taxes payable levied by the same taxation authority and the enterprise has a legally enforceable right to set off current tax assets against current tax liabilities. 53. In rare circumstances, an enterprise may have a legally enforceable right of set-off on a net basis for some particular financial years. In such rare circumstances, detailed scheduling may be required to establish reliably whether the deferred tax liability of one taxable entity will result in increased tax payments in the same period in which a deferred tax asset of another taxable entity will result in decreased payments by that second taxable entity. Tax Expense (Income) related to Profit or Loss from Ordinary Activities. 54. The tax expense (income) related to profit or loss from ordinary activities shall be presented in the income statement. 55. VAS 10, “The Effects of Changes in foreign exchange rates”, requires certain foreign exchange differences to be recognized as income or expense but does not specify where such differences should be presented in the income statement. Accordingly, foreign exchange differences arising from deferred tax liabilities or assets in oversea are recognized in the income statement and they may be classified as deferred tax expense (income) if that presentation is considered to be the most useful to financial statement users. 56. The major components of tax expense (income) should be disclosed separately. g) deferred tax expense arising from the write-down, or reversal of a previous write-down, of a deferred tax asset in accordance with paragraph 38.
a) the utilisation of the deferred tax asset is dependent on future taxable profits in excess of the profits arising from the reversal of existing taxable temporary differences. b) the enterprise has suffered a loss in either the current or preceding period in the tax jurisdiction to which the deferred tax asset relates. 60. The disclosure required by paragraph 58 (c) enable users of financial statement to understand whether the relationship between tax expense (income) and accounting profit is unusual and to understand the significant factors that could affect that relationship in the future. The relationship between tax expense (income) and accounting profit may be affected by such factors as revenue that is exempt from taxation, expenses that are not deductible in determining taxable profit (tax loss), the effect of tax losses and the effect of foreign tax rates. 61. In explaining the relationship between tax expense (income) and accounting profit at current tax rate, it provides the most meaningful information to the users of enterprise's financial statements. 62. The average effective tax rate is the tax expense (income) divided by the accounting profit. 63. It would often be impracticable to compute the amount of unrecognized deferred tax liabilities arising from investments in subsidiaries, branches and associates and interests in joint venture. Therefore, this Standard requires an enterprise to disclose the aggregate amount of the underlying temporary differences but does not require disclosure of the deferred tax liabilities. Nevertheless, where practicable, enterprises are encouraged to disclose the amounts of the unrecognized deferred tax liabilities because financial statement users may find such information useful. Where changes in tax rates or tax laws are enacted or announced after the balance sheet date, an enterprise discloses any significant effect of those changes on its current and deferred tax assets and liabilities (see VAS 23 “Events after the balance sheet date”).